The Times was accommodating enough to lead the story with a nice photo of a fishing boat motoring across clean water with several birds in the foreground. Thus, it’s only what is on the surface that counts. If you can’t see it, there is not a problem. This kind of government cover-up is nothing new, of course. “It is well known that after the Chernobyl accident, the Soviet government immediately did everything possible to conceal the fact of the accident and its consequences for the population and the environment: it issued “top secret” instructions to classify all data on the accident, especially as regards the health of the affected population,” journalist Alla Yaroshinskaya has written. In 1990 Yaroshinskaya came across documents about the Chernobyl nuclear catastrophe that revealed a massive state cover-up operation, coupled with a calculated policy of disinformation where the then Soviet Union’s state and party leadership knowingly played down the extent of the contamination and offered a sanitized version to the public, both in and out of Russia. To date, studies continue to show ongoing human and environmental damage from that disaster. When the disaster at Chernobyl occurred, it was only after radiation levels triggered alarms at the Forsmark Nuclear Power Plant in Sweden that the Soviet Union admitted an accident had even occurred. Even then, government authorities immediately began to attempt to conceal the scale of the disaster. In late April, after the Deepwater Horizon rig exploded and sank into the depths and the Macondo well began gushing oil, BP and the complicit Coast Guard announced no oil was being released.The Gulf Restoration Network flew out to the scene and saw massive amounts of oil and sounded the alarm, which forced BP and the US government to admit there was, indeed, oil. Such has the trend of BP/US Government lying, countered by (sometimes) forced accountability, then to more lying, been set. These most recent, and most blatant of the BP/US Government propaganda gems are easily undermined by countless facts. 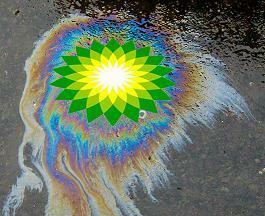 Reality and truth always, given time, find a way to surface…just like BP’s dispersed oil. Two captains of so-called “vessels of opportunity” helping with the cleanup recently told Times-Picayune reporter Bob Marshall that they saw more oil at South Pass on Tuesday than they have during the entire crisis. “I don’t know where everyone else is looking, but if they think there’s no more oil out there, they should take a ride with me,” charter captain Mike Frenette said. Another captain, Don Sutton, saw floating tar balls for 15 miles from South Pass to Southwest Pass. “And that wasn’t all we saw. There were patches of oil in that chocolate mousse stuff, slicks and patches of grass with oil on them,’” he said. Yesterday I spoke with Clint Guidry, a Louisiana fisherman who is on the Board of Directors of the Louisiana Shrimp Association and the Shrimp Harvester Representative on the Louisiana Shrimp Task Force created by Executive Order of Louisiana Gov. Bobby Jindal. “Right now, there is more oil in Barataria Bay than there has been since this whole thing started on April 20,” Guidry told me. BP oil is now turning up under the shells of post-larval blue crabs all across the northern Gulf of Mexico. Nearly all the crab larvae collected to date by researchers, from Grand Isle, Louisiana all the way over to Pensacola, Florida, have oil under their shells. Further analysis is showing that the crabs likely also contain BP’s Corexit dispersant. On August 5th it was reported that a pair of fishermen in Mississippi “made an alarming discovery that has many wondering what’s happening below the surface” of the Gulf of Mexico. They found several full-sized crabs filled with oil. The National Oceanic and Atmospheric Administration (NOAA) report from Wednesday claims that 33 percent of BP’s oil in the Gulf has been either burned, skimmed, dispersed, or directly recovered by cleanup operations. NOAA goes on to claim that another 25 percent has evaporated into the atmosphere or dissolved in the water, and another 16 percent has been naturally dispersed. Of the remaining 26 percent, NOAA claims that amount is either washed ashore, been collected from beaches, is buried along the coasts, or is still on or just below the surface. Giant plumes of BP’s sub-surface dispersed oil are floating around the Gulf of Mexico, as confirmed recently by researchers from the University of South Florida. It was also recently revealed that the worst dead zone in 25 years has been recorded in Gulf of Mexico waters. Of course it’s likely a given that this is due to BP’s liberal use of dispersants. “When we landed after our 2-hour flight, our pilot told us that she sometimes has to wipe an oily reddish film off the leading edges of her plane’s wings after flying over the Gulf. Hurricane Creekkeeper John Wathem documented similar oily films on planes he chartered for Gulf over-flights. Bonnie doesn’t wear gloves when she wipes her plane. She showed me her hands — red rash, blisters, and peeling palms. I should point out that from my first days Louisiana, I’ve been hearing from fishermen working on BP’s clean-up operations that BP is using night flights to drop dispersant on oiled bays. I’ve seen video taken by fishermen of a white-foamy substance in the marsh the morning after these flights took place. Blanchard went on to say that he felt that BP did not want to clean up the oil, that it was more cost effective for them to leave it in the water than to clean it up, and then mocked the preposterous government claim that most of the oil is gone because you cannot see it from the air. The lives of Gulf coast fishermen and residents are being destroyed. Scientists, environmentalists, and toxicologists are describing the Gulf of Mexico as a growing dead zone, a kill zone, and an energy sacrifice zone. As you read this, oil is everywhere around southeastern Louisiana, and continually washing ashore in Alabama and Mississippi. Of this, Louisiana’s St. Bernard Parish President Craig Taffaro said it’s no secret that BP wants to drill again. In fact, he said, it has been part of his conversations with BP since the oil crisis began. Let us be clear about who, and what, we are dealing with here.